Scripture Scribes Intermediate “One Another” has scripture writing with the words &quot;one another&quot; found in the New Testament of the Bible. There are 50 lessons in the book, covering 2 pages each. Each lesson has the student trace the scripture, and then write it out. The lines are dashed, but smaller than your traditional cursive writing lines from elementary school. The verse is copied 4 different times in different versions in each lesson. Each time it is traced, and then rewritten. The Bible translations used are KJV, NKJV, ICB, and ESV. There are a few additional information pages within One Another that I really enjoyed. One was a list of the books of the Bible, approximately when they were written and by whom, and the language that it was in. I found this list to be super. I love that these verses are all ones that could easily be used as memory verses as well. They would be very easy to memorize. They are being read, copied over, rewritten at least four times. Have your student choose their favorite version, or even the one your family uses the most often. We use NKJV mostly in our school and church so I prefer the kids memorize in that version just to keep it stream lined for them. 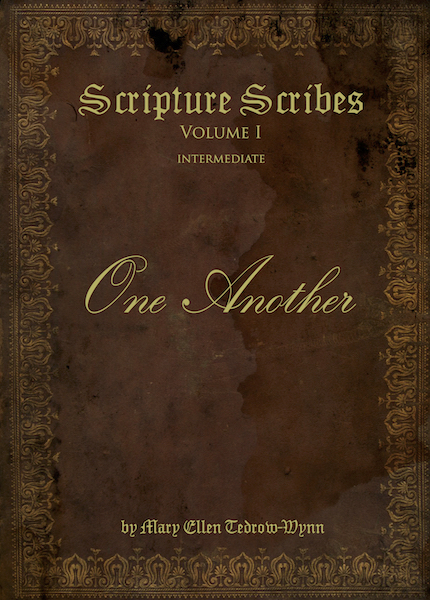 Scripture Scribes Intermediate One Another is more than a simple copywork book!